Never Carve a Pumpkin AGAIN!!! 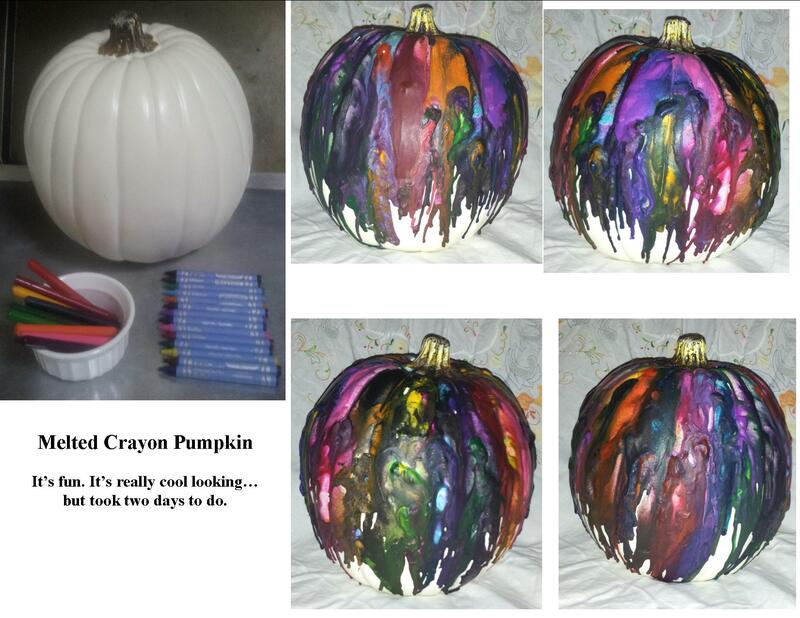 A friend shared a picture of a pumpkin decorated with crayons. Not drawn on – MELTED on! I loved the idea so much that I showed my daughter (we call her Duchess) the picture. She decided at once that we MUST do this. Now that she’s quickly turning into a teenager, I seize every opportunity to do things together. This certainly fit the bill. Back at home, we took labels off and broke crayons into two or three pieces. Using a BBQ lighter, I melted one end of a crayon and stuck it to the top of the pumpkin wherever she pointed. All around, changing up the colors randomly until we thought it was enough. Using a hair dryer, we melted them. (Note to self: Next time wear ear plugs.) When you do this, put down newspaper. Wax might splash. Then we stuck on the glitter crayons and melted them over the first layer. This isn’t a one hour project. It took us a total of at least six hours spread over two days to complete but the result is absolutely worth it! Duchess loves her spooky, melty decorated pumpkin and we had terrific fun choosing which clumps needed more melting. Next year, we can either add more to this pumpkin to change its look or we can get another and start all over. And I never again will have disgusting, smelly pumpkin guts in my trash can or a slowly rotting pumpkin in the house! This year, we made another. We used a smaller pumpkin and recorded the process with the stop animation setting on Duchess’ 3DS. See The Amazing Melty Crayon Project! Walking with Santa, because I’m married to him and sometimes we’re on the street going somewhere while he’s fully dressed, I watch the faces of the people passing us. I see the ones that turn to look again, and their smiles. I see the expressions of people on the subway when Santa, in his full regalia, steps onto the train (yet no one offers him a seat, even though he’s carrying a sack that weighs 40 pounds lol). I see grownups chasing after Santa with a camera, rather like 7 year olds running after the ice cream truck. A Friday night in 2012, I was witness to one of the greatest experiences ever. I’d been sitting in the Pax restaurant at 40th and 6th Avenue, just outside Bryant Park. Waiting for Santa to arrive so he could have a little supper before we went together to his second event of the day. A little girl about four came in with her Daddy and I was hoping beyond hope Santa would show up before they left. He was coming from 23rd street, but it was raining and more people use the trains. That makes it harder to get on one when you’re taking up so much more room than others. It took him some 40 minutes to get from point A to point B.
I was tempted to engage the girl and her father in conversation, asking if she’d been a good girl and was looking forward to seeing Santa. And how would she feel if he walked in that door right now? But seeing the clock and how far along they were in their dinner, with Dad prompting her to finish up so they could leave, it wasn’t looking good. They left and another family came in. Obviously tourists. Gramma, mom and three kids. A boy about 6, another boy about 8 and a girl around 10. I have no idea how their trip to NYC had been going. They were a couple tables back from me and I couldn’t really hear their conversation much. The six year old, as six year olds are, was antsy and couldn’t sit still in his chair. For the moment he did, he had his back to the steps where people come up into the seating area. Santa called me to say he’d come up out of the trains at the park and people were stopping him to take pictures. He’d been at an art school, modeling for the students in full Santa regalia and had to travel to the second fully dressed. Let me explain something. He’s not just a guy who puts on the suit. He IS Santa. He becomes the embodiment of the spirit of the myth that is Santa. When you see the look on a child’s face and the OHMYGOSH IT’S HIM IT’S HIM IT’S HIM in their eyes, you know the depth of their belief. So, I sat there trying not to explode with excitement for what these kids were about to have happen to them. I saw him come in the side door on 40th Street and turned in my seat to watch that other table. The 6 year old, as 6 year olds commonly are, was turned onto his knees backwards in his chair. This was perfect. He wasn’t being naughty. He was just being six and had had a long day, I’m sure. Sitting at a table is NOT easy. Tables are BORING! I knew when Santa came into view. That little face and those little eyes became as big and bright as the full moon rising on a cloudless night. “IT’S SANTA!!! MOMMY, IT’S SANTA!! !” he burst, right arm jamming into Mommy’s arm. She turned in her seat to look and her jaw about hit the floor. The 8 year old saw him and the mouth fell open. The girl saw him, but I was more focused on the little ones. She was old enough that she had to play along for the little one but likely didn’t believe herself anymore. Does she now? I don’t know. She just might. Santa went to their table at once, not even putting his bags down, and talked to the children. He asked how their trip to NYC was going and if they were enjoying the city. He’s in town pre-planning his route, and doesn’t have his reindeer because, since 9-11, NYC is a no-fly zone. He has to leave the reindeer and sleigh at LaGuardia. I couldn’t hear everything said. The smiles said it all and that’s good enough for me. There was a brief applause of excitement from the adults in the room…and then DEAD SILENCE except for him quietly talking to the children. You could have heard a pin drop in the rest of the place. OH CRAP! SANTA’S HERE! We better be good! Santa only spoke with them a couple minutes before coming to the next table and relieving himself of the huge sack on his back. As Mrs. Claus and his helper, I brought his supper to him, prepared his coffee, etc., so he could sit and rest from the journey. And I watched for the eyes. Those darting little eyes that can’t stay off SANTA!!! Not for five whole seconds together. They were having dinner…and SANTA was having supper…in NYC…AT THE NEXT TABLE!!! As he was finishing his meal (because Santa eats FAST! ), they were finishing theirs as well. I discreetly vacated my seat so he could invite them to sit a moment and talk one on one. You know, because that’s what Santa does. The 8 year old was first…and I remembered I had chocolate covered peppermint sticks in the bag I’d been lugging. I right quick opened the bag and snatched up three out of the container and slipped them to Santa. And removed myself again. Intrusions during one on one time have to be kept to a minimum. This is the CHILD’S moment, not mine. So I retreated to the sugar/utensil station. The mother and grandmother came over, smiling like smiles could smile to tell me how thrilled the kids were. They KNEW he was the REAL SANTA because his beard IS REAL! It’s not one of those horrible white things sitting on his face. And he KNEW they were from out of town. So the family finally made their way to the door and left. When they get home, their friends will hear AAAAAAAAAAAAALLLLLLLLLL about it! For the rest of their lives, they will NEVER forget the time they met SANTA at supper on their otherwise boring trip to NYC.